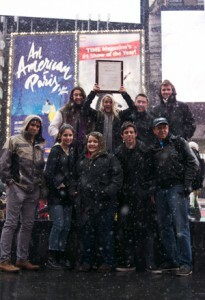 Feather editors celebrate in Times Square after earning a CSPA Digital Gold Crown, March 20. As the conclusion of the Feather editorial staff’s trip to New York City, staffers attend the Columbia Scholastic Press Association (CSPA) crowning award ceremony at Columbia University, March 20. This event, which takes place on mid-afternoon Friday, reveals whether students have received a Silver or Gold Crown for their efforts. After anxiously waiting for their paper to be called, staffers finally got the news that they earned a CSPA Gold Crown, the highest award given by the CSPA. This is the third consecutive and fifth time overall that The Feather has taken home this award along with two Silvers since 2008. The Feather is honored to be recognized by such a nationally acclaimed source. Staffers hope to continue the tradition of taking home a Gold Crown. Next semester, The Feather will be moving in a new, more modern direction with a new website layout. The Feather will also work to implement more texture and media through new outlets. 2,691 students attended the convention, representing 299 schools within 34 states. Some schools even represented neighboring nations, such as Mexico and Canada. Editor-in-Chief, Chloe Mueller, ’16, reports an attitude of elation towards this win, and motivation for the future. 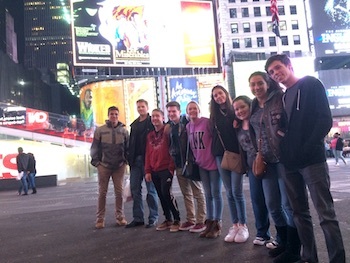 Senior John Dooman, Reviews Editor, shares the highlight of the New York trip along and winning the Gold Crown award. Videographer Timothy Nyberg, ’16, explains his reaction to winning the CSPA Digital Gold Crown and looks forward to working for the gold next year. While The Feather Online did not qualify for a National Scholastic Press Association Online Pacemaker for the second year in a row, the staff is excited to rebuild the website and be more forward thinking to include a more modern look and feel with an emphasis on media. Look for the changes by summer’s end. Along with The Feather, the Foothill Dragon Press from Ventura, CA, was also awarded a Digital Gold Crown. Follow The Feather via Twitter @thefeather and Instagram @thefeatheronline. This writer can be reached via Twitter: @_sarapeterson. For more features, read the March 18 article, Alumna shares personal journey, life with professional athlete. 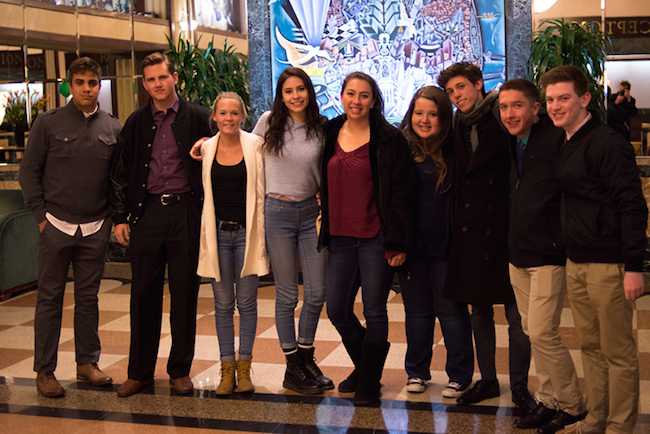 Feather editors traveled to New York City in March and won a CSPA Digital Gold Crown at Columbia University. The Feather was awarded a Digital Gold Crown at the 91st annual Columbia Scholastic Press Association (CSPA) journalism convention at Columbia University in NYC! This is The Feather Online’s 3rd Gold Crown in a row and 5th CSPA Gold Crown since 2008. The Feather also has earned two Silver Crowns. Here is the link to the winners. We competed for a Digital Crown and only one other California school won the same award. Other California schools won Gold in the hybrid category. For more photos, visit Rock and Worship Road Show and Elementary track and field. 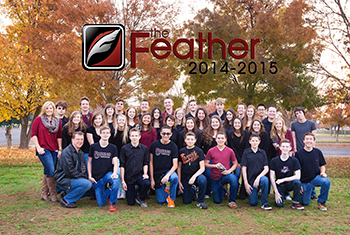 The Feather gathered for their annual staff photo in October 2014 on the Peoples Church campus lawn. This is my first year taking journalism and it has majorly affected my writing skills. Though it is not a walk in the park, it can be fun and also very helpful. I have to be committed and responsible to be in publications. A journalist involves working outside of your comfort zone, which presents opportunities to gain self-confidence and self-esteem. The Feather adviser, Greg Stobbe, has taught me many things about how to write and how not to write. The tools that journalism offers can be used in everyday life, not just in publications. You can also take photojournalism which focuses on take pictures and videos of events that are happening. I was a little hesitant about joining this class but with Stobbe always telling me to join, and a friend?s persuasion, I joined. I had thought about how these writing skills can benefit me in the future, especially in college. It took me three weeks to write my first article. Day by day I try to increase the efficiency and speed of writing my articles. The writing skills you acquire from this class sticks to you. It will help you when you write essays for your english class or in future articles you will write. Journalism is one of the few subjects that can fully train students for skills that are essential to the job field. It can also bring attention to some colleges and they may reach out to you. Many consider journalism an easy A elective when in reality it is one of the the harder classes you can take. Students need to write two to three new articles each month or their grades will drop significantly. Stobbe has high expectations for the articles that go up on The Feather. The more you write, the more you learn. He can be funny and mess around sometimes but he can also be very serious and focused at other times. One of the first things he shows you is what not to do. I have learned I should always introduce the person before the quote and do not use contractions and now know the importance of show don’t tell. I’m still working on not using helping verbs. Throughout the year I have been improving in my writing skills an am contemplating signing up for publications class again next year. But I do know that journalism helps improves writing skills. I have experienced the positive and negative sides of journalism. Though this is my first year taking journalism; it gave me the opportunity to meet new people. While I did not start as the best writer, and I still am not the best, journalism is helping me get better. This writer can be reached via Twitter: @nataliatorres1. For more opinions, read the March 5 article, Community reflects on life of Molly Griffin. While the group still needs to tighten up sessions for the CSPA convention, Feather editors gather in the lobby of Hotel Edison before they embark on a day of touring Manhattan, March 17. The Feather editors started their first day of tourism in New York City on the holy day for the Irish: St. Patty’s Day, March 17. With a couple of days dedicated to checking out the Big Apple before attending and speaking at the 91st annual Columbia Scholastic Press Association’s (CSPA) convention, today FC hits NY. Attempting to avoid a sea of green chaos, adviser Greg Stobbe suggested the team spend most of their day in Little Italy and Soho, eating and shopping. The staff departed Hotel Edison at 8:15 a.m. and made their way to the nearest subway station before the parades and celebrators crowded Times Square. Not eating before their departure, the staff insisted that the first thing they do in Little Italy was get breakfast before treading onward to shopping. Heading the cries of his people, Stobbe led his staff to Ferrara: an Italian bakery and cafe with a wide range of different kinds of food options. Though breakfast meats were available, many of the students opted for the pastries. After finishing breakfast the female staffers abandoned their male counterparts to get an early start on their shopping, leaving the men behind in the cafe in favor of rushing to Soho and all its stores had to offer. Their shopping spree was short lived, however, as a couple of the girls fell ill and left Soho early to get back to the comfort of their hotel rooms. Though the women were down for the count, the men endured through the elements and their check balances. Before impending bankruptcy set itself upon them, Stobbe intervened and called the men to Il Palazzo where they enjoyed an authentic Italian lunch. The boys left for the hotel at 2 p.m. and arrived at around 2:30 p.m.
After the five-hour nap, the students woke from their dens and began preparing for the first play of many on their trip. Upon departing the hotel 7:10 p.m. everyone soon felt the nose numbing wind that New York had to offer. Racing from the subways and the streets the team eventually made their way to the first play, The King and I, which began 8 p.m. and ended at 11 p.m.
Once the play ended, hunger soon plagued the students again. They left the theatre and moved to the subways to get back to Times Square. Upon arriving, the team immediately spotted an Applebees and moved like predatory animals towards this beacon. Once they finished their food everyone departed for the hotel and arrived at 12:30 a.m. Most of the Feather staff went to their rooms and prepared the next day for the journalism conference at Columbia University. For more about The Feather in NY, read the March 16 article, FC hits NY: Day 1 (Slideshow, Video). 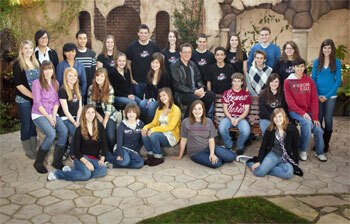 The choir, ladies ensemble, jazz band will all attend the Worldstrides Heritage Music Festival, March 5-8. The FC band and choral groups will be traveling to the Los Angeles area to participate in the Worldstrides Heritage Festival program, March 5-8. The choral groups sing and play prepared repertoire for three judges, or adjudicators. These professional musicians and college professors grade each group based on a series of various factors such as tone, balance, diction and musicality. This festival hands out rankings as well, with trophies awarded in several categories. If a group is particularly advanced, the adjudicators can invite them to a “Gold” festival, which is usually held at Carnegie Hall in New York City. The FC women’s ensemble has been invited to the Gold Festival before, but has not attended. All the choral groups are working diligently on festival repertoire. Each song must have a high level of difficulty, and cross over different eras and styles of music. For example, the HS choir will sing a Latin piece called “Jubilate Deo,” performed acapella. They will also sing a Canadian folk song entitled “Rattle on the Stovepipe.” Lastly, they are singing a spiritual melody, “1 Peter 3:15”, which features soloists Andrew Guthrie, Elise Winegarden and Ivette Ibarra will be presenting to the judges. This year, ladies ensemble will attend Heritage as well as the junior high choir, high school band and choir. The groups will depart from school at lunch on Thursday, March 5, and will be traveling to their hotel in Irvine. Dinner will be provided at Medieval Times, and Friday will be spent at Disneyland. Newly appointed high school choir director Susan Ainley, talks about the Heritage Festival. 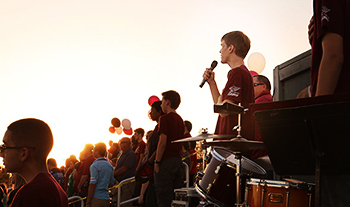 Andrew Moore, ’16, talks about his experience and thoughts on the Heritage Festival. While singing is the reason to head south, Hannah Nale, ’17, has another reason to travel. While freshman Celeste Counts is excited about Disneyland, she is concerned about her role in the festival. These writers can be reached via Twitter: @_jadenventura03 and @Devin_pits1735. 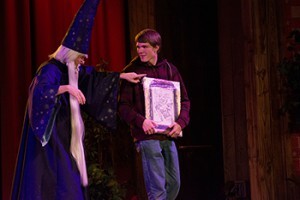 For more news, read the March 3 article, Student leadership: FCS 32nd annual auction is March 14. 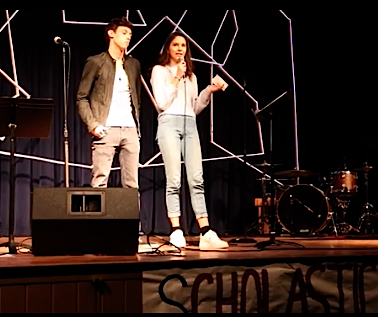 Juniors Rees Roggenstein and Chloe Mueller share in assembly the importance of scholastic journalism, Feb. 23. Publication students throughout the nation will be celebrating the art of Journalism during Scholastic Journalism Week, Feb. 22-28. This yearly event, sponsored by the Journalism Education Association (JEA) was created to raise student awareness about their First Amendment rights and civic responsibility. Scholastic Journalism Week is used to promote the efforts of high school journalism students throughout the nation. This year the JEA has chosen “Our Staff at Work” as the logo to motivate people to see the efforts of student publications and The Feather staff wants to share the importance of scholastic journalism. Editor-in-Chief Chloe Mueller gives insight into the celebration of Scholastic Journalism Week and student publications throughout the nation. The Feather will be taking a student survey asking what the campus would like to see on The Feather and will include the results in an info-gram. This year in honor of promoting journalism week, The Feather staff has also created a hashtag for Twitter: #FCJW as well as #SJW2015 which will appear on The Feather’s Storify. Please share why the First Amendment is important to students’ voices today. To ensure that the school is staying up to date with journalism week, The Feather is putting on a friendly competition. The campus student who tweets and includes #FCJW the most this week, will win a $15 gift card of their choosing. For more videos, check out Girls soccer hosts Frazier Mountain for D-VI championship (Video). For the fifth year in a row The Feather recieved an All-American rating and five out five marks of distinction from the National Scholastic Press Association (NSPA) who released their annual web critique, Feb. 23. For the fifth year in a row The Feather recieved an All-American rating and five out five marks of distinction from the National Scholastic Press Association (NSPA) who released their annual web critique for 2014, Feb. 23. The Feather scored the top in all five essential categories: Coverage and Content, Interactivity and Community, Breaking News, Design and Navigation and Rich Media along with scores from Student Work Credit and Frequencie of Update Credit. With the combination of the five high score in all five categories and the two extra sections, The Feather receives NSPA All-American rating and a score of 3,992/4,300 points. Feather adviser Greg Stobbe expresses his gratitude for the nomination, but acknowledges that there is still more work to come for staffers. Starr Sackstein, World Journalism Prep School, critiqued The Feather and shared her thoughts of the website. Chloe Mueller, Editor-in-Chief, shares her opinion on the review and how it has affected her motivation to carry out the rest of the semester. 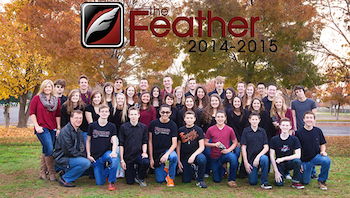 Follow The Feather via Twitter and Instagram: @thefeather and @thefeatheronlilne. 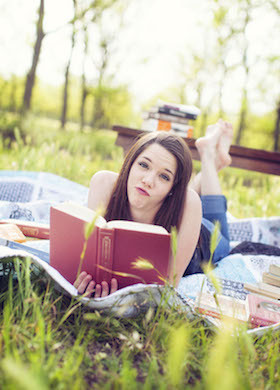 This writer can be reached via Twitter: @_sarapeterson. For more news, read the Feb. 23 article, BRIEF: Scholastic Journalism Week, Feb. 22-28 . Scholastic Journalism Week is used to promote the efforts of high school journalism students throughout the nation. 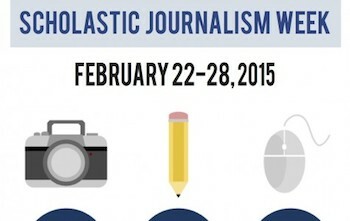 Scholastic Journalism Week is used to promote the efforts of high school journalism students throughout the nation. This year the JEA has chosen “Our Staff at Work” as the logo to motivate people to see the efforts of student publications. Chloe Mueller, Editor-in-Chief, gives insight into the celebration of Scholastic Journalism Week and student publications throughout the nation. For more news, read the Feb. 20 article, BRIEF: Winter Sports Banquet welcomes athletes, Feb. 23. As The Feather has been headlining student events, featuring stories about Homecoming, issues of social equality and the sport season beginnings, this week the tables are reversed. To promote the importance of school publications, the Journalism Education Association (JEA) has sponsored the annual Scholastic Journalism Week, Feb. 22-28. The organization encourages student journalists to raise awareness, promoting its significance to the community. Along with a student created poster template, the JEA has listed several ideas for student and publication adviser participants. While the event is geared towards those apart of a educational journalism program, community members, including readers and students can get involved. Throughout the week, The Feather will be watching social media including Twitter and Instagram, by creating a hashtag: #FCJW as well as #SJW2015 which will appear in a Storify collection. Responses from staff writers, editors and advisers, were documented in order to highlight the significance of journalism education not just nationwide, but locally. The Feather wants to encourage students and readers to submit their opinions in the comment section on the effects of journalism and why seeking out and reporting the news is important. 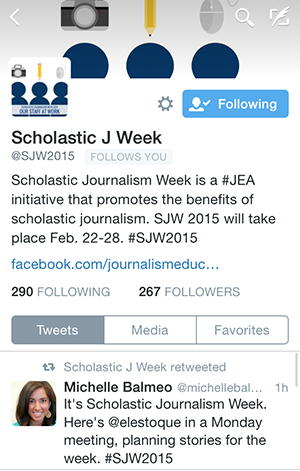 Please consider adding to or joining Scholastic Journalism Week 2015: Join the discussion. Senior Andrew Guthrie gave his testimony during chapel, Jan. 22. Senior Andrew Guthrie gave his testimony during chapel, Jan. 22. Guthrie shared about the trials he has endured throughout his life. He specifically spoke about his junior year when his mother and three of his grandparents passed away. Guthrie encouraged the crowd to lean on God’s strength during difficult times. Quebe: Was this your first time sharing your testimony? If so, why have you not shared it before? What was going through your mind? Guthrie: Yes, I have never actually given a testimony like that before, mainly because I never thought anyone would care to hear it or be affected by it. But while speaking, I realized that it was making an impact by the responses I got from others in the school, so that helped me keep talking. Quebe: What was the one thing you wanted people to remember about your testimony? Guthrie: I wanted people to realize that although I’m not necessarily done with my struggles, I have seen how amazing God’s help had been over these past several years, even if they were small things at the time. The little helpful actions can drastically help later. Quebe: Why do you feel that is something important to remember? Guthrie: Sometimes we want a huge change, or are overlooking the small steps God has for us to reach a much better place. Overlooking these small steps will leave you stuck behind. Quebe: What is your encouragement to someone going through similar struggles? Guthrie: That there is some good in all the bad you may be facing. God has strengthened me through the struggles I have faced, and even though I have had a difficult 2014, I am stronger and better built in Christ. Quebe: Do you think going to FCS helped you at all to get through life’s struggles? If so, how? Who is one person you feel had a major impact on your life? How? Guthrie: Yes, I think FCS has helped me through my struggles and has strengthened me immensely by providing a place where there are people who want to connect and be together. Quebe: Who is one person you feel had a major impact on your life? How? Guthrie: Someone who has greatly reached out to me and been like a brother is Jordan Castro, who always gave me a different view on my issues so that I can see them as God strengthening me, not hurting. Quebe: Do you think you will ever share your testimony again? Why or why not? Guthrie: Yes, I would share it over and over if it helped even one person. I don’t expect my story to be any more powerful than others, but it is sincere, and I think people need to hear true stories from those they can relate to. Please feel free to comment about what you took away from Guthrie’s testimony. Follow The Feather via Twitter and Instagram: @thefeather and @thefeatheronline. This writer can be reached via Twitter: @_olivialoren_. For more features, read the Feb. 3 article, Where are they now? Todd Bennett. 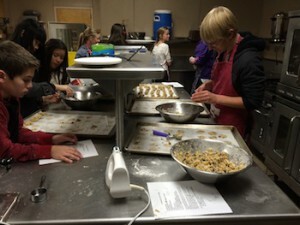 Students in Sharon Scharf’s home economics class are preparing treats to send to soldiers overseas. For years, the home economics department has worked to touch others with their handiwork. In the past several years, home economics is striving to not only benefit members of the school and community through their work, but to stretch their reach beyond the bounds of Fresno County. Friday, Nov. 21, both periods of home ec. whipped up piles of cookies for a noble cause. Home ec. teacher, Sharon Scharf, has connections to a member of our Army member LTC Eric Ogborn, and decided to support his cause through her work on campus. The batches of cookies were sent to LTC Ogborn, who is currently stationed in Germany but deployed in Afganistan. Scharf explains how the cookies were made. Scharf and her home ec. crew began shipping out their treats thirteen years ago. The tradition started with her nephew, who was stationed in Afghanistan. For more features, read the Dec. 4 article, Featured app: RETRY. Art teacher Sharon Scharf entered campus artwork in the high school section of the Clovis Art Guild Fall Show in the Veteran’s Memorial Building in Old Town Clovis, Oct. 20-26 to represent Fresno Christian. “I’m a firm believer in getting our name out there,” Scharf said. “It’s only been in the last three years that the Clovis Art Guild has opened the high school division up to schools other than Clovis schools. We want them to know that we appreciate it. Scharf said each semester she picks student artwork she feels reflects a quality effort and technique. Each of the student work this year is no exception. She has no plans to hang the drawing and actually thinks she will just stick it in a drawer for now. The Clovis Art Guild invites art students who have entered the show were also encouraged to join the judges and artists at their meetings – where there is always a demonstration. Sydney Belmont and Michael Fu also had entries in the show. “I enjoy talking to the art teachers from the other schools, getting idea to bring back to our school,” Scharf said. 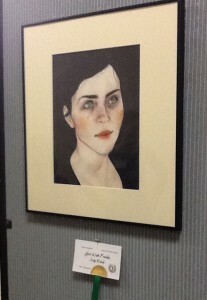 “I wish more of our students would take advantage of the Art Guild shows. The next Clovis art show will be in conjunction with the Clovis Rodeo in April. Please check out the 2014 Old West Rodeo Art Show. FC’s own Michael Fu was one of the winner’s last semester. For more photos, visit The Feather’s photo section or check out Twin Day is underway or King dance tomorrow. Senior Tynin Fries shares her appreciation for adviser Greg Stobbe in her final Feather article. She will attend Arizona State University in the fall, joining the Barrett Honors College. I wish I had known on the first day of school just how much you would teach me about journalism, myself and my future. Stobbe you were the sole reason for my motivation throughout school. As I lost my favorite teachers and watched them move away, you stayed a constant encouragement. The Feather and your crazy mind kept me from breezing through high school like everyone else. You pushed me to my limits and made me feel insane. For months I stayed up late, meeting and surpassing your expectations. Stobbe you’re the most inspirational teacher I’ve ever had, and probably ever will have. You put four years of work into me, and I won’t let you down. Just like my parents will see their finished product when I move away, so will you. Now that you’ve done your job, it’s time for mine. These last four years have been grand. We visited New York, Seattle, Disneyland and San Diego. We taught classes, won awards and even met famous people. You gave me more opportunities than an average kid could dream of having. But rather than the big things, I’ll remember the small lessons you taught me. That when I’m too stressed it’s okay to get wheeled around the room, even if I think there’s no time. New things are scary, but also very cool. And Twitter isn’t just for morons. This next year will bring be changes for me and you. And I hope that you never lose your inspiration to inspire. There will always be a freshman, eager to learn from you. Don’t give up now because you’ll always be a teacher. You mean more to me than any other teacher, Stobs. I can’t wait to return in a few years to make you proud of the student and person you helped create. I love you, Stobbe. Write on! This writer can be reached via Twitter: @TyninFries. Follow The Feather via Twitter: @thefeather. She will attend the Walter Cronkite School of Journalism and Mass Communication and Barrett, the Honors College, at Arizona State University. For more senior reflections, read the May 20 article, Senior overcomes struggles, builds confidence. Students from throughout Northern California entered in the Association of Christian Schools International (ACSI) art festival. 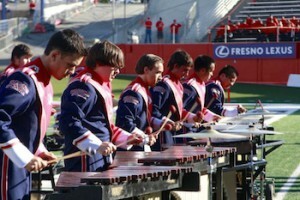 The competition was held in Sacramento Ca at Trinity Christian School, May 9. FC was one of eight different schools entered into the competition and as FC students earn ACSI awards at he competition. Sharon Scharf, art teacher, entered 24 students to encourage the students and give them a sense of competition. Sophomore Michael Fu took best of show out of all the 10th grade entrees. Sydney Belmont, ’17, entered into the competition and was honored and pleased with the recognition of her good work. “I submitted charcoal drawing of the Eiffel Tower,” Belmont said. “It took me two weeks to complete it. I was really surpassed to get second best of show, it is a real honor. Bye-Bye Birdie was originally inspired by Michael Stewarts’ novel, Lets go steady. The production hit Broadway in 1960. This year the FC drama department has embarked upon a whole new genre, musicals. 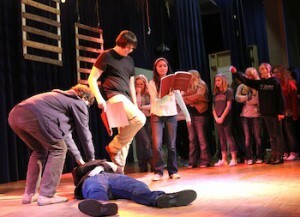 Drama students are scheduled to perform Bye-Bye Birdie at Ground Zero, March 6-8. As the date of the event draws ever near, the cast prepares to give a stunning performance. Bye-Bye Birdie was originally inspired by Michael Stewarts‘ novel, Lets go steady. The production hit Broadway in 1960. It is the story of a fictional American pop- star, Conrad Birdie, who was drafted into the war. Birdie?s manager and song writer, Alfred Peterson, arranged one last publicity stunt in order to promote Birdie?s last song. He was to appear on the Ed Sullivan Show and give one girl from his fan club a farewell kiss. Drama and choir director Susan Ainley has considered doing a musical for many years. She says the number of drama students this year made it possible. She choose Bye-Bye Birdie for its lovable plot and lively music. “I have been thinking about this for a long time,” Ainley said. “When I saw I had thirty students signed up for drama this year, I knew we would do it. I love this musical, it?s fun and exciting. It has great characters that the audience will love. The music from the time period is great too”. Alexis Kalugin, sophomore drama student, will be singing in the ensemble of this musical. She says that preparation will involve determination and hard work. However she believes that the school function will be a success and is excited to dance on stage. Due to the early deadline, and increased difficulty of the production, drama students have frequent practices and rehearsals in order to prepare themselves, including lunch, after school and weekend meetings. A choreographer has also been hired to insure that the major musical routines go smoothly. 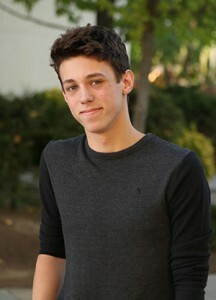 Senor drama student Kyle Hudecek will be playing the role of Conrad Birdie. He looks forward to the singing and dancing numbers, although he admits that learning dance steps and full songs will take more time and dedication than that of a regular play. Music director Michael Ogdon and the jazz band have partnered with the drama department for the production. The jazz band will play the musical numbers and add to the authenticity of the program. The Adoration Ensemble and the Kingsmen Quartet will also be featured. They will aid in increasing the volume of the cast and harmonizing. Ainley says she anticipates a spectacular performance from her drama students and is eager to see the Senior students try something new in their last semester of drama class. She encourages the Fc community to join the audience. Tickets for this event will be available for pre-sale in February at the price of $10 and at the production for $15. For more features, read the Jan. 10 article, Teacher continues family’s multi-generation mission work. 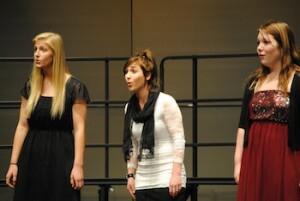 Taylor Neufeld (left) sings her solo at the fall performance. Imagine being up on stage, ready to preform in front of the crowd. All eyes are on the performers now, anticipating the entire choir’s performance. One student has just joined the musical group and she has to sing a solo, despite struggling with hitting the high notes. Taylor Neufeld, ’13, had an experience very similar to that. Neufeld joined choir because of her love for singing and for a chance to prove that she can sing. She joined choir this year since it did not fit in her schedule previously. 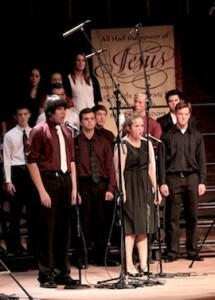 Neufeld is an alto singer and was featured in a solo in the fall concert. According to Neufeld, she loves performing for people and making others joyful. Neufeld struggles with hitting high notes as an alto and timing her breaths correctly. Though her obstacles have never caused her problems in performances, being in choir has helped her learn how to hit the higher notes. According to fellow alto choir member Gillian Rea, ’16, she believes that all of the alto section struggles with self-confidence. Neufeld was one of the soloists chosen for the fall concert. While some students may have felt anxious, she was filled with excitement. As a senior on campus, she loves getting to know her other class mates and is eager for the semester to end. Neufeld did not expect to experience ‘senioritis’ but finds herself tired of the daily schedule and is excited for a break from school. Along with love for singing, Neufeld knows American Sign Language (ASL). She began learning ASL in sixth grade and has some experience with performances because of it. Music director Michael Ogdon enjoys having Neufeld in his class and the opportunity for Neufeld to sing with the other choir members. To read more about the Fall Choir concert, read the Oct. 17 article Choral department to hold fall concert. For more features, read the Dec. 14 article, Most wonderful time: Join the discussion, 2012 (VIDEO). Anderson founded the Cat Haven in 1993 with the hope of educating his visitors about endangered cat species because his passion was peaked in seventh grade, according to the website. Imagine watching a mountain lion, prowling in it’s habitat, so close you could almost touch it. This summer a group of students had an experience similar to this at Project Survival’s Cat Haven in the Sierra Mountain foothills near Dunlap. Home economics and art teacher Sharon Scharf invited alumni Alexandra Barisic, Becky Barisic, Barisic’s mom, and seniors Ashley Erickson, Kevin Thao, Juan Ruelas and Katie Barisic to Project Survival’s Cat Haven to snap photos of the wild cats, June 7. Scharf’s friend Wendy Debbas is involved in the Cat Haven’s activities. Debbas has lead safaris in Africa and helps support a orphanage in Kenya. Scharf traveled to Debbas’ house and snapped pictures of two 23-week old jaguar cubs. 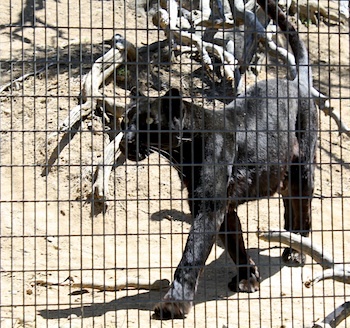 Scharf saw the photos Debbas took of the different wild cats protected at the Cat Haven and wanted her students to be able to photograph the same cats. The group met at Blossom Trail Cafe and then left for the Cat Haven. When they arrived they received an introduction and a tour. As he got older he decided he wanted a unique way to help different species of wild cats. He hoped it would teach others about the endangered species and encourage them to help. Erickson was one of the many vistors who learned more then they would have thought while attending the Cat Haven’s tours. Katie and Erickson were the first students Scharf invited on the trip because of their experience with this particular kind of art. The group was guided from habitat to habitat, learning about each cat as they were able to observe them in a habitat very similar to their natural setting. Fellow classmates agreed with Katie, reflecting on their experience on the haven and agreeing that others should visit the haven. Traveling to the Cat Haven to see the cats is not the only option. The sanctuary takes its smaller cats to public events such as the Madera Fair or to other schools. The cats have also been on the TV program, The Tonight Show, and spent time with different celebrities. Scharf would like to work with the Cat Haven to arrange a day when they could bring some of the smaller cats on campus, as the haven has not yet been presented to FC. For more information on the Cat Haven, visit their website or make the drive to 38257 E. Kings Canyon Rd. Dunlap, CA. 93621. The entrance fees are $9 for adults and $6 for children 6-12. Seniors are $7.50. Visitors can also contact them via email or by phone at 559.338.3216. For more information on the field trip, email Scharf. For more features, read the Sept. 11 article, Seniors bond through activities, strengthen relationships. The Feather Online is poised to receive at least a Silver Crown from the Columbia Scholastic Press Association’s annual competition in March. They have already received notification of the Silver and await the competition in NYC. After losing several seniors after the 2008-2009 school year, the staff of The Feather Online has continued to compete on a national level, winning at least an Online Silver Crown from the Columbia Scholastic Press Association (CSPA), Feb. 17. 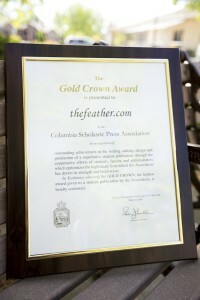 The Crown recognizes The Feather’s online coverage during the fall of 2009, ranging from excellence in page design to article quality to multimedia features. The Feather Online was one of 27 online newspapers to be named a finalist, making them automatically a Silver winner, and eligible for a Gold Crown; the winners of which will be announced at Columbia University in March. Several Feather staffers will travel to New York to receive the award and attend a three-day CSPA conference, March 17-19. Senior editor Austin Ward, ’11, says the honor of the award is even more meaningful considering the staff has 10 fewer members from last year’s high of 40. For sophomore David Casuga, the Crown award marks the first competition in which The Feather has been recognized during his tenure as webmaster. He is excited that the CSPA recognizes The Feather with Crown. Despite the jubilation of many staff members, some newbies are only being introduced to the world of competitive scholastic journalism through the award. For more information about The Feather and its staff, read the Dec. 4, 2009 article, The Feather adds new multimedia features or the Jan. 21 article, Classroom antics, journalism occupy veteran teacher. Or, e-mail adviser Greg Stobbe. Editors Mary Kneefel, Andrew Rurik, Jennifer Sherfield and adviser Greg Stobbe pause after The Feather Online won the NSPA Pacemaker in April 2008. That old adage is ubiquitous, inescapable in every walk of life. It doesn’t want to go away. Everywhere I turn, there is some situation that the phrase can apply to. As true as this is for sports teams, it is also true for journalism staffs. I entered into this year way over my head. Mr. (Greg) Stobbe had asked me the year before to be the webmaster to give The Feather Online a simple aesthetic makeover. However, after a few summer meetings, that ‘simple little makeover’ turned into starting from the ground up. The previous webmaster (Matthew Shattuck, ’07) was truly a master of the web. I, on the other hand, was essentially learning (or re-learning, as I did have some previous experience) as I went. This made for some interesting days and weeks as the designing process of The Feather began. So about a month passes, and there have been setbacks upon setbacks. We are now into the first part of October, hoping to go live in December, and I am in way over my head. Thus begins the credit giving part: David Martens, the IT director, stepped alongside me and helped me out immensely. I do not believe that The Feather Online would operate anywhere as close to as smoothly as it does now without Martens’ help. He took the projects that were way out of my knowledge base and broke them down into smaller pieces, giving me projects I could handle and helping me when I got stuck. However, even more credit remains to be doled out. The Feather staff went down to Anaheim, April 17-19, to win an Online Pacemaker award from the NSPA. That is no small feat. As much praise as we as a staff have received, I would like to distribute a little more. To all of our editors: You guys are phenomenal. As six of the eight of you graduate, let me just say what an honor and privilege it was to work with you these past two years. All the writers: You all write a lot more articles than I do, and although the Pacemaker is awarded to the online newspaper, the article content is probably 75% or more of what we won on, so keep up the amazing work. And finally, to Stobbe: Thank you for pushing me this year, for constantly showing me ways to improve, taking me to what I think is my limit and then showing me that there’s more, for driving me towards excellence in this endeavor and not being short on both constructive criticism or compliments. There is no ‘I’ in team. Not one person won us our Pacemaker. Thirty-three of us students banded together for the long haul and came out on top as a team. Where credit is due? And to us our team–we received the credit; we were due. Co-editor-in-chiefs Mary Kneefel and Jennifer Sherfeld pose with adviser Greg Stobbe after The Feather wins its second Pacemaker. “I’m giving you this position, I didn’t have to, so I can take it away whenever I want,” Feather adviser Greg Stobbe told her. With beginnings like that, how could brand new Editor-in-chief Mary Kneefel go wrong? After Brianna Stobbe, ’06, led the Feather to their first National Scholastic Press Association (NSPA) Online Pacemaker in 2006, adviser Stobbe felt ready to pass the role on to Kneefel. Her up-and-down experience in the class paid off. When Kneefel, as a freshman, was encouraged by brother Alec, ’05 , to join publications, she had doubts about the class. From beginnings as a freshman reporter, Kneefel was forced to overcome her inhibitions to get the perfect quote, opening or transition. Out of the fear of braving Stobbe’s scrunity alone, Kneefel recruited friends Michelle and Jennifer Rose, ’08, other four-year journalism students. After finishing her freshman year still not sure about journalism, Kneefel made the decision to come back. Experience for college and a supportive class atmosphere motivated her to return. After finishing her sophomore year, Stobbe felt he was ready to pass the torch. The transition from quiet staff writer to head of the paper gave Kneefel a new sense of responsibility, to the Feather and to Stobbe. Junior Kneefel took on the Editor-in-chief role the year after winning a national award as a writer. After about a month and a half of school, she was joined by Jennifer Sherfield, ’08, to help sift through the dozens of articles and compile editorials, among other tasks. After winning a national Pacemaker in 2006, The Feather staff lost 18 seniors, and started almost from scratch with juniors Kneefel and Sherfield to head the class. Kneefel and Sherfield sacrificed lunches, after school and vacation time to keep the paper running. While beginning Editor-in-chief duties, Kneefel appreciated having a partner to share the volume of work and responsibility. After being nominated for the national Pacemaker in 2007, Kneefel and Sherfield were joined by several new editors and they strived to reprise their 2006 success. After years of practice and three months of constant writing and editing, Kneefel and Sherfield were rewarded by winning another NSPA Pacemaker, in Anaheim on April 19. After only two years on The Feather, Sherfield still feels the repercussions of her efforts. Sherfield will attend Fresno Pacific University next fall with a major in liberal studies. Kneefel plans to study at La Sierra University in Riverside receiving a degree in clinical laboratory science and then Loma Linda University Adventist Health Sciences Center, to specialize in radiology. For the first time in campus history, The Feather is the Sweepstakes winner at the San Joaquin Valley Scholastic Press Association’s (SJVSPA) annual publications competition at Fresno State, March 1. For the first time in campus history, the Feather print edition was named the Sweepstakes winner of the San Joaquin Valley Scholastic Press Association’s (SJVSPA) annual publications competition, March 1, 2008. The Mass Communication and Journalism Departments at California State University, Fresno, annually sponsor the event. The contest consisted of three components: mail-in competition, critique of fall semester’s newspapers and on-the-spot contests. Fifteen schools and 145 students participated in the workshops and competition. The Fresno State competition began in 1931 and the previous winners alternated between five other campuses: Golden West High, Tokay High, Bear Creek High, Bullard High and Stagg High. Although the staff only received two awards in the first 20 minutes of the presentation, the second half honored nine other reporters. Gary Rice, Executive Director of the SJVSPA and journalism professor, presented senior Mary Kneefel, Editor-in-chief, with the three-foot trophy after he announced The Feather wins SJVSPA Sweepstakes. For four of the last five years, the Feather has won the SJVSPA Small Schools Division and named an All-Valley Newspaper. This campus earned the distinction of Sweepstakes winner, while beating all schools, regardless of size or division, between Stockton and Bakersfield. The staff’s score of 121 narrowly beat out Golden West by one point and last year’s winner, Stagg High, by nine points. This campus came closest to a Sweepstakes win in 2000, but fell a few points shy. This year, The Feather was in a similar situation, but experienced the opposite outcome due to sophomore Sydney Ray’s first place rookie feature award. Stobbe believes Ray’s decision to persevere compensated for the past shortcomings to clinch first place overall. The Feather staff continues to pursue excellence in high school journalism as one of the top 10 finalists for the Pacemaker competition sponsored by the National Scholastic Press Association. The winners will be announced, April 19. After months of editing and dedication to the campus newspaper, The Feather, senior hard copy editor-in-chief, Gary Darakjian, center, and senior online editor-in-chief, Brianna Stobbe, right, received first place in the Small Schools Division at the SJVSPA competition at Fresno State, March 4. In now its 60th year, the San Joaquin Valley Scholastic Press Association (SJVSPA) invites junior and senior high media and communication students from Lodi to Bakersfield to compete in its annual competition sponsored by the School of Mass Media and Journalism at Fresno State University, March 4, 2006. After months of editing and dedication to the campus newspaper, The Feather, senior hard copy editor-in-chief, Gary Darakjian, center, and senior online editor-in-chief, Brianna Stobbe, right, received first place and a SJVSPA All Valley honor newspaper award in the Small Schools Division at the SJVSPA competition at FSU on March 4. This is the second year in a row The Feather was awarded this honor. Additionally the online version of the paper is currently being judged by the National Scholastic Press Association in its two-month competition. Results of this contest will be made available in April. Darakjian, who has been on staff for three years, also received first place in the on-the-spot lay-out and design competition. The on-the-spot competitions were open to students from all divisions. Other onsite winners were seniors Kassy Batesole and editor Spenser Koleen. Both writers received honorable mention in on-the-spot contests: Batesole for a sports article and Koleen for an editorial. Students pound their mouses into their mouse pads as they hopelessly search for the location of the school’s newspaper website. Little do they know that behind the scenes, the journalism staff, along with technology director, Dave Martens, have worked tirelessly to produce a better website. The Feather back online is the staff’goal and its at www.thefeather.com. Highwired.com, The Feather’s old Internet provider folded due to lack of funds and journalism was forced to produce a website from scratch. Highwired gave space to high schools to show their newspaper, classrooms, and sports. It also housed The Feather for three years and still holds its archives under the name www.highschooljournalism.org. This site also displays 350 newspapers including a link to The Feather. With Highwired’s demise, the American Society of Newspaper Editors has also taken over the rights of Higwired to follow suit and display high school newspapers at www.asne.com. For more information on The Feather, please go to www.theFeather.com and e-mail the staff or use www.FresnoChristian.com. Students may also call the high school office at 297-9464 and leave a message on adviser Stobbe’s answering service at 297-9464, ext. 151. After taping him to the wall and left in the sun to bake, Kinnear was heard calling, “Help me,” from a classroom on the second floor. The drama class had all abandoned him hanging there after lunch and gone to class.